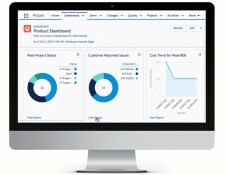 Santa Clara, California, October 26, 2017	(Newswire.com) - ​​​​​​​Propel, a modern cloud Product Lifecycle Management (PLM) software company, today announced general availability of Specification Management & Compliance and Training Records Management, two new solutions that will help companies of all sizes improve product compliance and deepen customer trust. Propel’s Specification Management & Compliance allows companies to quickly and flexibly manage product compliance requirements that customers most care about, such as RoHS, product safety, forced labor, IP confidentiality, and conflict minerals. Also available in Propel’s Winter ‘18 Release, Propel’s Training Records Management helps companies in regulated industries track training compliance for all employees involved in making products. Tracking compliance can be very time consuming and error prone when products consist of thousands of parts, involve hundreds of employees and suppliers, need to meet multiple regional requirements, and undergo dozens of changes. Mid-market companies have faced additional product compliance challenges, since existing solutions are often expensive, hard to implement and difficult to use. Propel’s latest cloud PLM software release allows companies of any size to track compliance to product specifications and training requirements much more easily than ever before. Propel provides visibility into compliance status for any product, tracks historical records and updates, and keeps managers and stakeholders in the loop. Propel makes cloud PLM software that helps propel your digital transformation. Created by PLM, SaaS and manufacturing veterans, Propel offers cloud PLM that helps engineers, marketing, partners, customers, and everyone else collaborate on all the product information needed to get products from concept to customer. Propel has developed the first and only PLM solution built on the Salesforce platform — the world’s most secure, trusted and flexible cloud platform. Our SaaS-based PLM software helps everyone collaborate better, takes just weeks to get up and running, and can keep up with changing business requirements. For more information, visit propelPLM.com. Propel is the platform for tomorrow's brands. Propel offers cloud PLM, PIM and QMS solutions that help everyone else share all the information needed to get products from concept to customer. For $1500 a Month, Small Businesses Can Get Started with the Propel Innovator's Edition in Just 1 Week.